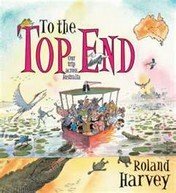 Roland Harvey Review: The picture book To the Top End is a travel book unlike any other. Roland Harvey fills each watercolour painting to the brim with - depending on the environment depicted - plants in vivid detail, stunning vistas, flowing water, deep sea monsters, a supposedly extinct Thylacine, Tassie Devils, Wombats, big crocodiles, Red-Tailed Black Cockies, Uncle Kev, the lot. The book charts a family's journey through rural Australia. The adventure begins in a Tasmanian rainforest on a double page spread. The family then edges further north - on the next image the family traverses the hazardous Bass Strait on their way to the Australian mainland. There are 14 double page spreads in all. Each one is a beautifully detailed snapshot of the wildly beautiful and varied Australian environment, from the temperate rainforests of Tassie to the tropical lushness of the far north of Australia: the Top End. To The Top End makes a very effective language/literacy teaching tool. There are many details of Australian flora and fauna and travel themes to explore in each double page spread. I tend to use the book with an atlas, which students use to help chart the family's journey. An encyclopedia of plants and animals is also a valuable tool to have at your side when reading the text. A special mention must be made about the font used by Roland Harvey, which I dare say is written in his own hand using Indian Ink. The striking black hues of the text are written in highly imaginative and clever ways and actually interact with events on the page. There is a very funny instance of the text interacting with the story, which literally follows Uncle Kev's highly unnerving ultralight flight around the large boulders of Kata Tjuta! I won't spoil the surprise, or the flight's outcome (read the book) but I will say that Uncle Kev is my new personal hero. Each panel demonstrates Uncle Kev's incredible bravery and sheer joyous recklessness. I can't decide if the man is an idiot or an inspired genius. Every family needs an Uncle Kev!